The other night I bought myself a bottle of Boone’s Strawberry Hill. Don’t ask me why I thought this was a good idea, but I had a notion to ironically review the worst drink that I could find, like maybe a Zima or a Mike’s Hard Lemonade. I strolled through the liquor section of the closest Circle K, and the Boone’s label just seemed to call to me from the depths of the bottom shelf. I purchased the bottle of seemingly innocuous, light pink wine, and took it home to review. There are some things that time helps you to forget, and the wretched strawberry soda flavor of Boone’s Strawberry Hill is one of them. If there was anything I succeeded in that night, it was in drinking the trashiest tasting booze I could find. You’re looking at a guy who’s drank Four Loko, and I’m saying that Boone’s Strawberry Hill is worse. I went looking for trouble, and boy, did I find it. There’s a reason this is the drink of choice amongst delinquent 14-year olds world over. Boone’s Strawberry Hill is for people that want something with a little more kick than a Mountain Dew, but also want to save the Raspberry Smirnoff Ice (you know, the good stuff) for the weekend. It gave me a nasty hangover, and I was so disgusted with myself for this stupid idea, that I scrapped the entire article and started fresh. I needed fresh inspiration, and Trader Joe’s once again came to the rescue. It’s still somewhat cold here in Southern California (meaning I was shambling around the store in flip-flops, board shorts, and a hoodie), so winter ales can still be found on grocery store shelves. 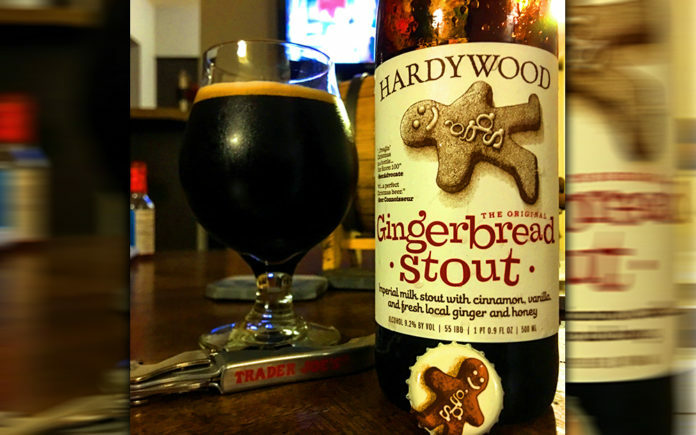 With a sign advertising the nice, low price of $4.99, I decided that a Gingerbread Stout from Hardywood Park Craft Brewery would be the beer du jour. The Richmond, Virginia based company isn’t well known on the west coast, but their three taproom locations in their home state proves that they’ve developed a loyal fanbase, and their gingerbread stout has earned a spot on Trader Joe’s shelves without being one of their contract brewed house-brands. 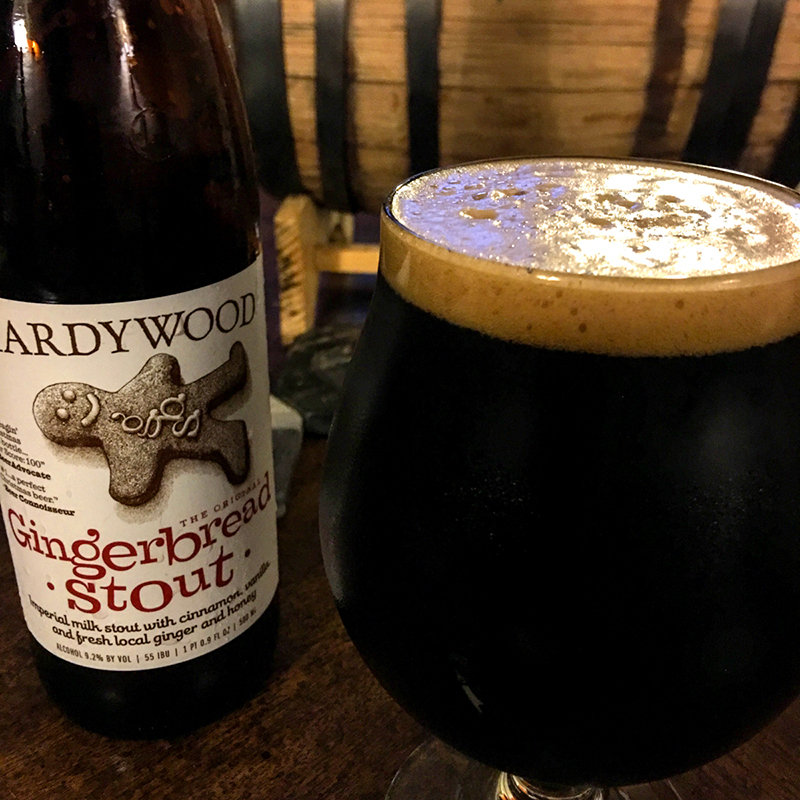 The flavors of ginger and baking spices have been married successfully into stouts before, Golden Road has a gingerbread stout that I rather enjoyed, and so does…no, not them, let me think…no one. Literally no one else bothered to make a gingerbread stout. This is a severely underrepresented style (I mean, for good reason, I suppose. I’ve never once heard anyone say that they could go for a nice tall glass of gingerbread right now), and according to the blurbs printed on the bottle, this is supposed to be a good one! Let’s pop the gingerbread man covered cap off this bottle and get to rating, shall we?